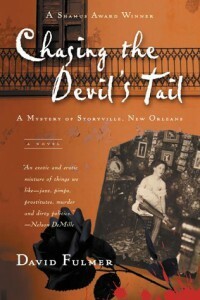 The Hudson Area Library Book Group has chosen to read Chasing the Devil’s Tail: a Mystery of Storyville, New Orleans by David Fulmer for their May meeting. Discussion will be held at the library on Thursday, May 7 at 3:30pm. Stop by the Hudson Area Library or call 828-1792 to order a copy of the book. Storyville, 1907: In this raucous, bloody, red-light district, where two thousand scarlet women ply their trade in grand mansions and filthy dime-a-trick cribs, where cocaine and opium are sold over the counter, and where rye whiskey flows like an amber river, there’s a killer loose. Someone is murdering Storyville prostitutes and marking each killing with a black rose. As Creole detective Valentin St. Cyr begins to unravel the murder against this extraordinary backdrop, he encounters a cast of characters drawn from history: Tom Anderson, the political boss who runs Storyville like a private kingdom; Lulu White, the district’s most notorious madam; a young piano player who would come to be known as Jelly Roll Morton; and finally, Buddy Bolden, the man who all but invented jazz and is now losing his mind. No ordinary mystery, Chasing the Devil’s Tail is a chilling portrait of musical genius and self-destruction, set at the very moment when jazz was born. This entry was posted in Adults, Programs and tagged Book club, book group, Chasing the Devil's Tail, David Fulmer, mystery, New Orleans, Storyville by Emily. Bookmark the permalink.